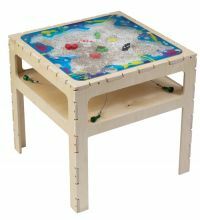 The Magnetic Sea Life Table is such a compelling toy that it will keep kids from “drowning” their parents in boredom complaints for hours! Children will be mesmerized as they use magnetic wands to move ocean creatures through the sea. With life-like animals to control, kids will happily participate in imaginative play. Such an entertaining table is not only perfect for the home, but is a useful (and fun!) distraction to use in waiting rooms. For Ages 3+.